To celebrate more than forty years as the world's foremost aviation and military art publisher, we are delighted to present an outstanding Masterwork by Gerald Coulson, specially released from the archives of the Publisher. It was probably the most versatile aircraft of World War Two and the missions undertaken by the Mosquito and her crews have rarely been equalled for their daring or precision. Powered by two Rolls-Royce Merlin engines, the Mosquito was not only fast and agile – for most of the war it could out-perform anything in the sky – but deadly: possessing the ability to carry almost every weapon in the RAF’s arsenal. These qualities enabled Mosquito squadrons to perform every conceivable role from ﬁghter-bomber to photo- reconnaissance, intruder, pathﬁnder, night-ﬁghter, V-1 hunter, anti-shipping attacks and, thanks to its agility and speed, low-level precision strikes. In tribute to this magnificent aircraft Gerald Coulson, one of the world’s most widely collected aviation artists for over 50 years, portrays a scene that was played out at airﬁelds all over wartime Britain after the Mosquito entered widespread service in 1942. Coulson is as famous for his landscapes as his aviation works and this stunning painting captures the mood perfectly as the dimming light of dusk reﬂects off the dispersal area, and Mosquito crews make their ﬁnal preparations for the night’s operations. The heroic crews who flew the ‘wooden wonder’ had nerves of steel and carried out some of the most audacious missions of WWII. 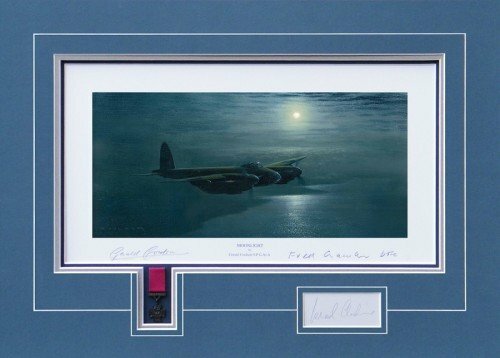 The Military Gallery is therefore honoured that the edition is signed by men who flew the Mosquito in combat, adding great provenance to this poignant and atmospheric release. Legendary Pilot who commanded 617 Sqn, he was the youngest and most highly decorated Group Captain in the RAF.